2:06 OK, that's my planned trades for the day-I'm done. May rally later. Thanks for coming. 9:47 Tuesday was a high volatility day. Wednesday was low volatility. Thursday was high volatility. Today may be low volatility. 4/13/2012 10:32:05 AM MT sdg:: Feel like they just picked my pocket. 4/13/2012 9:41:19 AM MT Tg****:: Yesterday was the thirteenth day from the most recent top of the cyclical bull, a fib # and an end of day 50% retrace of the preceeding decline. If I was position trading I'd have shorted yesterday's close. 4/13/2012 9:34:09 AM MT Tg****:: I never got around to seeing how the wave59 natal forecast worked with other markets such as commodities. 4/13/2012 9:32:56 AM MT Tg****:: I found Al's moontide forecast and the way it often mirrors the slope of the 110 exma to be better and more useful than the wave59 natal forecast over time. Wave 59's natal forecast was pretty good though with some turning points coming right on the expected trend change. 4/13/2012 9:23:27 AM MT sdg:: I do like Al's method as it is more along the lines of trend following (my bias) versus trying to catch turning points with 9-3, UMI, and Smart money, and their version of natal forecasts. 4/13/2012 9:14:12 AM MT BBB****:: "Paralysis from analysis". I like that. sdg - you will notice that a lot of the astro stuff, though very good, will drive you nuts with inversions. With Al we are just looking at a few simple things. Much better if you ask me, but explore. If anything learn the Ephemeris - it is fascinating. 4/13/2012 9:06:04 AM MT sdg:: Thanks for the info; I was coming to the same conclusion..simple charts from IB will work with Al's info for me. Though I must say, there are some indicators that are not found elsewhere if you want to explore. 4/13/2012 9:03:21 AM MT Tg****:: BBB, funny we came to the same conclusion. I don't have the ability to focus on more than a handful of things when trying to figure out when or if to take a trade. If I have too many things going on I suffer from paralysis from analysis. 4/13/2012 8:58:59 AM MT Tg****:: I used wave 59 for years in tandum with Qcharts at one point then Esignal. Lately I've simplified down to just two live Esignal charts, a 3 min bar chart and 1 minute chart for judging the exmas more precisely. You can do some neat stuff with wave59 though and there is a FOG and FOP overlay that can work for the CTME course, too. Al has to tell them to turn it on for you after you've taken the courses. 4/13/2012 8:51:35 AM MT sdg:: Thanks Tg, seem to recall that (not enough coffee yet). New to wave 59 and I definitely see Al's influence on Earik's programming. 4/13/2012 8:47:47 AM MT Tg****:: sdg, fyi: the charts here are all Al's programming. 4/13/2012 8:32:22 AM MT AG:: Great stuff BBB. Congrats again. 4/13/2012 8:30:25 AM MT BBB****:: Healthy and happy thank you for asking. She has been good luck as had 3 great trades yesterday! 4/13/2012 8:21:55 AM MT SSP:: bbb healthy baby? 4/13/2012 7:34:59 AM MT BBB****:: Morning everyone - hope all is well. Good Luck today. 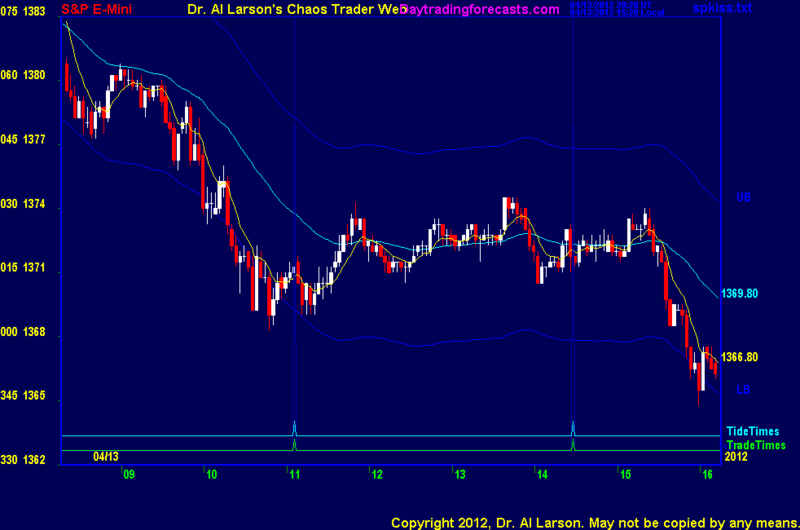 4/13/2012 7:29:38 AM MT sdg:: Al - are the charts on the screen from Wave 59? If so, can they be replicated based on your courses? Thanks for the Wave 59 referral.